I have been directed by the director of Foreign Operation/WirTransfer to write you in respect to your partner mail which we received earlier. Actually,we have earlier been informed about you by the young ladyChristiana Udeh(the next of kin)that she wishes you to be her trustee/representative for the claim of her late father's deposit with this bank. Her late Father(Dr Solomon Udeh) is one of our late customers with sum substantial amount of money he deposit with us.Hence you have been really appointed as a trustee to represent the next of Kin. However before our bank will transact any business concerning the transfer of the fund to your bank,we will like you to send the followings immediately to our bank. 1.A power of attorney which well permiting you to claim and transfer the funds to your bank account on her behalf. Note:This Power of attorney must be endorsed by a Senegalese resident lawyer. (Since the money is originated from Africa and the young lady is currently residing in Senegal). 2.The death certificate of Her deceased father confirming his death. 3.A copy of statement of account issued to her late father by our bank. please contact our Foreign Operational. Your partner MissChristiana was in my office with Rev Emmanuel George to discuss about the issuing to you an authorisation letter that will enable you stand on her behalf to transfer her money from ROYAL BANK OF SCOTLAND to your account in your country or elsewhere. Prior to my enquires from the bank and federal high court this morning,I understand from the bank that there are three documents required by them before the transfer of the money to you. 1.A copy of Death certificate of Dr Solomon Udeh. 2.A copy of His Statement of account..(WHICH I S ALREADY WITH NOW).It is now remaining one document.Which is power of attorney which will enable the Bank to deal with you on behalf of your partner. From my enquiries from the federal high court, it will cost the sum of 700euroauthentication of the power of attorney at the federal high court before it becomes valid and 300euro for notary stamping at the notary republic and My legal processing fee of 180euro, total (1,180Euro). To speedy the process you are to send these money to me today through western union money transfer system. (which is the fastest way of sending money to enable my noble office prepare and validate the power of attorney here in the high court and notary republic respectively. You are to send the (1,180Euro) with the name of my accountant through western union money transfer system. Senegal. Send or call me for the information as soon as you send the money to enable my accountant collect the money from western union local office here. 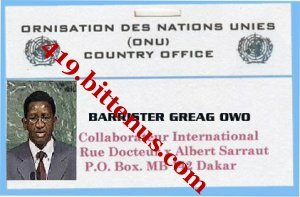 Attached here is my united nations staff identity card so that you can know more about the person you are dealing with. Subject: proszÄ™ mi pomÃ³c UKOCHANEJ do zapÅ‚aty pieniÄ™dzy na adwokata. Jak siê masz dziœ Wierzê, ¿e jesteœ dobrze ..
UKOCHANEJ To moja przyjemnoœæ pisaæ ten mail do Ciebie. Dziêkujê za maile mi³oœci i troski wobec Boga zawsze bêd¹ dla was b³ogos³awi trosce o sieroty jak ja i zapewniam was, ¿e nie bêdzie regreat pomaga mi jak otrzymasz zwrot pieniêdzy i zarz¹dzania na równi z reszt¹ pieniêdzy dla naszych future.My darling i poszed³ do adwokata z urzêdu w dniu dzisiejszym Revrend wiedzieæ, czy pe³nomocnictwo jest gotowy aby mo¿na by³o je podpisaæ, ale prawnik mi i Revrend, ¿e musimy zap³aciæ kwotê 1,180euro, zanim bêdzie przygotowanie pe³nomocnictwo ze wzglêdu na op³aty op³ata skarbowa w High Court przed sêdzi¹ g³ównym bêdzie znak w³adzy attorney.Please UKOCHANEJ mi pomóc jak ja dont mieæ anyother wyj¹tkiem jest osoba i ja jestem, zapewniaj¹c, ¿e nie bêdzie mnie jako pomoc regreat bêdziesz mia³ swoje pieni¹dze plus 20% moich pieniêdzy za pomoc, a jak wiesz, ¿e jest to jedyna rzecz w lewo, tak szybko jak my gat tym pe³nomocnictwo wszystko bêdzie over.I Jestem niewinna m³oda dziewczyna cierpi tu wszystkie nadzieje ¿yæ lepszym ¿yciem z Tob¹ niezw³ocznie po przekazaniu moich pieniêdzy na konto account.My darling, jeœli oznacza to bior¹c kredyt z banku, nale¿y zrobiæ to jak dla mnie bêdzie wróciæ zarz¹dzaæ swoimi pieniêdzmi i reszta naszej przysz³oœci. Dziêkujê Ci po raz kolejny w swojej mi³oœci i troski Bóg b³ogos³awi wam i dostarczyæ jak mi Pan pomóc. How are you today I believe that you are doing well..
My darling It's mine pleasure to write this mail to you. thank you for your mails love and concern towards God will always bless you for taking care of an orphan like me and i assure you that you will not regreat helping me as you will get your money back and equally manage the rest of the money for our future.My darling i went to the lawyer office today with the Revrend to know if the power of attorney is ready so that i can sign it but the lawyer told me and the Revrend that we have to pay a Sum 1,180euro before he will prepare the power of attorney due to the stamp duty fees at the high court before the chief judge will sign the power of attorney.Please My darling help me as i dont have anyother person except you and i am assuring you that you will not regreat helping me as you will have your money back plus 20 % of my money for your assistance and as you know this is the only thing left as soon as we gat this power of attorney everything will be over.I am an innocent young girl suffering here with all hopes to live a better life with you immediately after the transfer of my money to your account.My darling if it means taking loan from the bank,please do that for me as you will get back your money and manage the rest for our future .Thank you once again for your love and concern God will bless and provide for you as you help me.